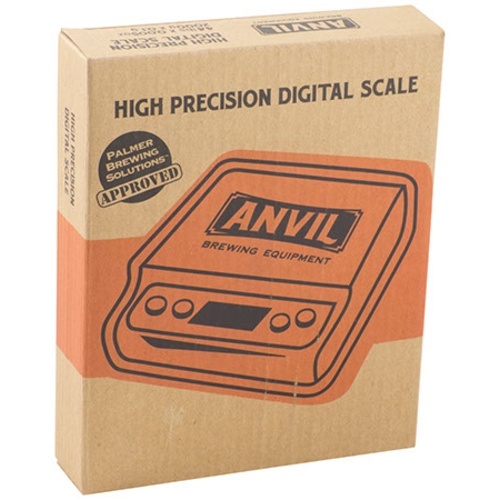 This high precision scale from Anvil Brewing is perfect for measuring hops, specialty grains, or water salt measurements. 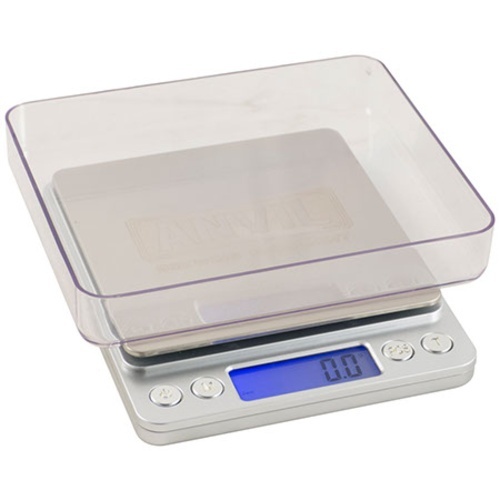 With its 4" x 4" weighing surface, this scale can weigh up to 4.4lb (2 kg) with a precision of 0.005 oz (0.1 g). Also includes a sample tray and protective cover. Need to measure yeast nutrient additions for mead. Could weigh grain in batches without being huge. Reviews reported that it worked very well. I own the large Anvil scale and love it but haven't been able to find a small scale that I like yet. Hopefully, this is the last one that I have to buy. Wanted a starter scale and didn't want to spend too much. It also looks like it can do exactly what I need it to. Used my friend's. Really like the fact that it measures to the thousands. My other scale is having issues so I thought I would try a different model. Plus this is half the price. Good reviews and good price. The accuracy I need for measuring "salt" additions. Simple to use. Love the easy-to-read display. I wish the manual that came with it was a little smaller, so that it would fit in the scale cover so that I could keep the manual with the scale. It’s a great little scale. Works as expected. Would be nice if it came with weight for calibrating. works well, first one inop but they sent me a new one without much question at no cost. i like the included trays and ease of function. 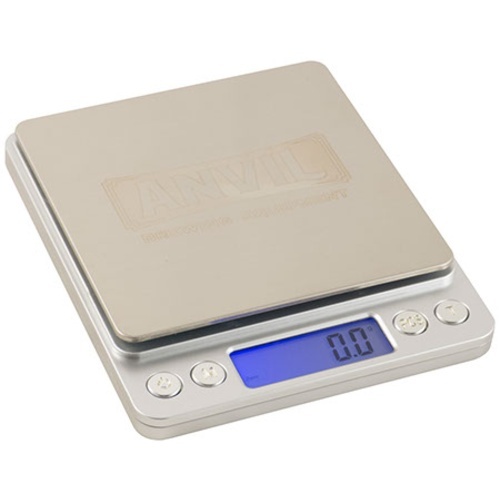 I do not trust this scale which bums me out as it is the perfect size and so easy to use. I had 2.5g of Alpha Bacteria and it measured it as 1g - boo. I was having trouble with getting the precision I needed for small batches. This scale solved that issue. Great value for the price. Love the look and feel...wish it worked. Unit arrived yesterday and this morning I was weighing out salts and noticed the additions seemed rather large. I went and got my Bladescale (purchased from MoreBeer 8yrs ago) and I was right. Please see video. I submitted a replacement request today. Hello Troy - Thank you for the review and video. Accurate and easy to clean and use. Love the accuracy to the thousandths. Compact but mighty little scale. Fits easily in brew day box and gets the job done. Very versatile regarding units of measurement. I use this as my main brew scale. I know the description says it is good for "hops, specialty grains, or water treatment measurements" - and it is. (Also great for measuring your DME for yeast starters) But if you brew 5 gallon batches like I do, it is no problem measuring your base malt in two (or even three) batches. The scale will hold a little over four pounds at a time. My biggest challenge was finding the right shaped container to use on the small 4" X 4" scale top. You need something that will not overlap the scale top too much and block your view of the read out, but has to be large enough to hold four pounds of grain. Think of something shaped like a plastic breadbox that can be stood on end. I finally found a tall, narrow ex-one gallon plastic ice cream box that is almost the perfect shape. But YMMV. I really enjoy how easy the Anvil Small Scale is to use. Power on and select which type of weight measurement you want to use (gram, ounce, etc). The screen is easy to read with a the blue back-light. The press of the buttons have a nice tactile feel to them. I haven't verified the accuracy of this yet but it definitely picks up each hop pellet! Love this scale! It says hello every time you turn it on. It also functions easily and changes type of measurement unit quickly. The screen is easy to read. I had no issues weighing out hops or putting a 2 liter flask on top to weigh DME for a starter. Everything I need in a small scale. Awesome scale, looks goodd, too. Excellent scale for the price. For the price this is a great little scale. I use it to measure my DME when making yeast starters. The scale works perfectly. I use it to measure hop additions for my 5 gallon home brew setup. For the size and the money, I can't imagine a better scale! Unbelievable price for a very good scale. This little scale is a real jewel, super accurate and easy to use. It is tiny in size yet capable of accurately weighing small amounts of hops to grain and extract up to 4.4 Lbs. What seemed to be a problem at first was that a vessel containing up to the maximum capacity and placed on center would obscure the display. Not to worry... after a trial I found that even with the load sitting off center it performs with the same phenomenal accuracy.